Before, as I found at "the litter side"
The design after take off the cousin. Everything is designed "on the fly", no draw before. Final result, after painting the legs with acrylic mat in black. Bottom view with a collage. If you don't like the other design, you can change. It's easy is Ikea !!! 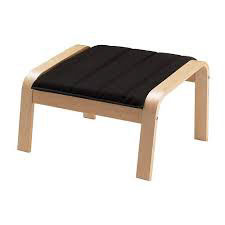 This is a Ikea Poang Footrest I found in the litter. I've decided to recycle it. Please check the WIP to see all the design process.